Visual effects has completely revolutionised cinema. And while occasionally you end up with films that use special effects as a commodity, that do nothing to enhance the experience, occasionally they are such an essential part of the film's narrative that you hardly realise they are there. Ang Lee's Life of Pi is one such film. 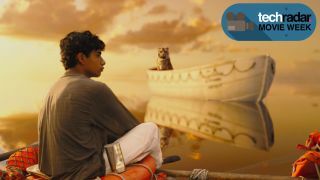 Without the use of visual effects, the story of Pi Patel's journey across the Pacific ocean on a lifeboat with the Bengalese tiger Richard Parker could not have been told. The effects were so impressive that it won visual effects supervisor Bill Westenhofer the Acadamy Award for best VFX at this year's Oscars. And in an interview with TechRadar, Westenhofer explained how technology made the creation of Richard Parker a possibility. "The biggest thing [about the technology advancements] is that the computers keep getting faster and faster and that allows you to do more and more," Westenhofer explains. "One of the interesting facts is that the total man hours we spend on a shot really hasn't changed since I started, we just do more things. Even though computers are hundreds of times faster than when I started 20 years ago, we just do a hundred times more calculations to get something more realistic." In the case of Richard Parker, those calculations involved getting accurate lighting effects around the tiger's fur. "One of things we were able to do was fully ray trace the hairs, meaning to map the way light bounces off the boat, bounces off the hair, bounces off these other hairs. There used to be a lot of fake lights and tricks to do first, you couldn't do that computation and now you can," explains Westenhofer. "There's also something called fur sub-surface scattering which is in a mass of hair, light would enter the mass, bounce around and then come out in a different direction, and you get a warm glow, especially in the white hair. Those little details really helped," he adds. Of course, it was more than just lighting and fur mechanics. The visual effects team spent eight weeks filming real tigers, getting reference material that would form the basis of the tiger in Life of Pi. Some of those shots would eventually make it into the film, although determining which shots they are requires a very experienced eye. "There was one real tiger that Richard Parker was modelled after - his name was King - and he's pretty much modelled hair for hair with the real thing. And you do see him occasionally - there are 180 shots of the tiger [in the film] and of them 20 of them are real," says Westenhofer. This reference video was crucial in allowing the effects team to create a believable version of Richard Parker. Westenhofer explains that there's no one thing that helps create a digital animal on film, but really a collection of things that all need to be included to create the overall effect. "It's details that make [the tiger] look real. From the animation point of view, we would work on a shot, Ang would sign off on the performance, and then we'd work for another two weeks on these tiny little nuances," he says. "We spent eight weeks with tigers, and got really detailed video reference of when a paw hits, you see this little wave that ripples up from the finger all the way up to the arm - it's getting those things in, and then you've got to light it correctly. And then there's the compositor's task to put it in there and add the shadows, doing the right thing. There's chromatic effects that happen when you film something through a lens that you pick up on that we have to properly model," he continues. With the level of realism attained in the digital version of Richard Parker in Life of Pi, you have to wonder how much further technology can take visual effects. Westenhofer believes that there will always be a place for actors, that visual effects aren't going to replace actors in films universally. "In the discussion of digital people, for example, people ask, "Do we replace actors?" And the quick answer to that is that what makes an actor so special is that actors do things subconsciously that we as animators have to put in consciously and think about and overdo it," he says. "In a scene they'll just walk up and put their hand up on the mantlepiece and it looks so natural. They're not thinking about it; they're not saying "my arm is up here at a 45 degree angle, my fingers is draped across…" they just do it because they can become a character, and it's not as easy to do that when you have to think about the entire process." In terms of what's next though, Westenhofer believes that visual effects has reached a point where 'what's next' will be replaced by the artistry of the craft. "It's just like cinematography, at some point you stop talking about the cameras and you talk about the artistry that the cinematographer employs. And I think the same thing is starting to happen with visual effects, and I think that visual effects is as much a storytelling tool as anything else; it's how well you tell your story that's going to be the thing that distinguishes you from the pack," he explains.